It never ceases to amaze me how the small things in life ultimately have the ability to have such a massive impact on us later. Often we don’t even notice it happening until we suddenly look back and see that if “this hadn’t happened, then that wouldn’t have happened….” and on the chain goes, link after link, until you find yourself where you are right now. For me the chain began with a single link thirty-ish years ago. I was a very shy teenager- self-conscious- awkward- the stereotypical wall flower. (Part of me still is!!) When I was thirteen I became ill- nothing life threatening, but exhausting. As a consequence I was unable to go to school for several months. My parents- to whom I will always be grateful- went to the nearest Radio Rentals and hired one of those new fangled video recorders so I could watch television whenever I liked during the day. The very day they signed that rental agreement, an episode of Robin of Sherwood aired on ITV (an HTV and Goldcrest production). That episode was called Adam Bell, and was the ninth episode of the third series- I watched it over and over again. For the first time in my life I had fallen in love. Not with any of the cast as such- I fell for the legend. It truly wasn’t the tight tights that had captured my heart – it was the story. The whole story. All of it. 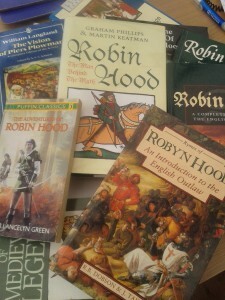 I wanted to know everything- EVERYTHING- that could possibly be known about Robin Hood. No film, book (nonfiction or fiction), was safe from me. The interest became an obsession (In RH not Ray Winstone). 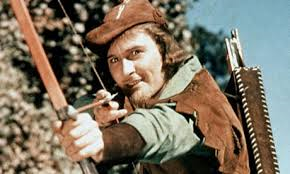 When I was better my parents took me to Sherwood- I learnt archery, I read medieval political poems and ballads- I wanted to know the truth- did he exist or didn’t he? I did a project on RH for my A’ level History. Then I went to university and did a specialist course in Medieval Castle and Ecclesiastical Architecture…I was a medieval junky!! It seemed only natural to do a PhD on the subject- and that is exactly what I did! And all because I’d watched an episode of Robin of Sherwood. It was my PhD that taught me to write- (a tome of epic proportions that is still knocking around my old Uni library gathering dust, while e-versions of it are scattered around many American Universities). 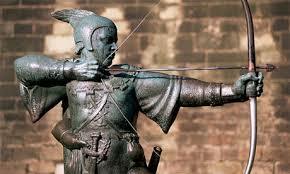 I guess it was only a matter of time before I decided to write a novel about a Robin Hood obsessed historian. 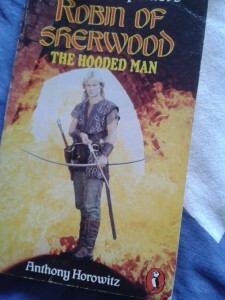 So here I am, 30 years from watching that initial episode- the parent of two children who also love Robin of Sherwood– and the story continues to have an effect. Two weeks ago I had the good fortune- thanks to a fellow writer (bless you Fay!!! )- to come across a lovely chap called Barnaby Eaton Jones, who has managed the impossible. 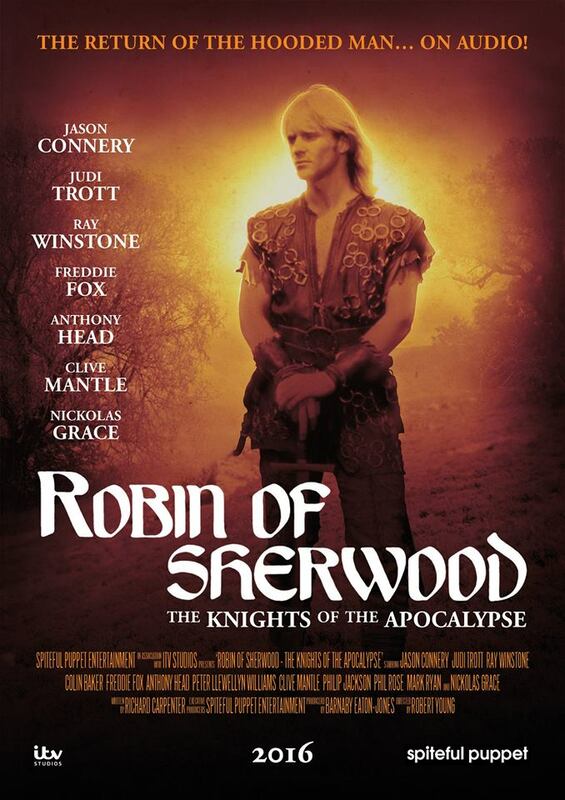 He has produced a brand new episode of Robin of Sherwood!! With the original cast (Jason Connery as Robin) he has put together (with the help of a brilliant cast and crew), an audio version of what happened next after the heart breaking end of series three. – the Sheriff of Nottingham has a message for you! One thing has always bothered me- I believe in the importance of saying thank you. 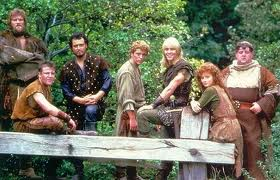 I have always wanted to thank the cast, crew, and writers of Robin of Sherwood. They set me on a course that has taken me from a shy child to an adult who has learnt how to handle that shyness, and given me a career I love. It’s difficult to do this without coming across like a crazed fan or some sort of hyper fan-girl (I’m neither- just a regular fan! )- but now I have that chance. Perhaps if I hadn’t watched RoS, I’d be doing something totally different with my days!? What a wonderful story. I fell in love with Robin too. For me it was Richard Greene at a much younger age as well. I predate you. Well, I also fell in love with history aged eight and never looked back. You should be writing medieval stories. I so enjoyed Romancing Robin Hood , an extremely intelligent duel time story. Wonderful. ‘Robin of Sherwood’ had an emotional impact on me back in the ’80s when I was a teenager, I cried bucket loads when Michael Praed’s Robin died. I shall look for your novel!